Proprietary Name: 4 Kids Earache Relief What is the Proprietary Name? Non-Proprietary Name: Atropa Belladonna,oyster Shell Calcium Carbonate, Crude,lycopodium Clavatum Spore,anemone Pulsatilla,sulfur And Matricaria Chamomilla What is the Non-Proprietary Name? 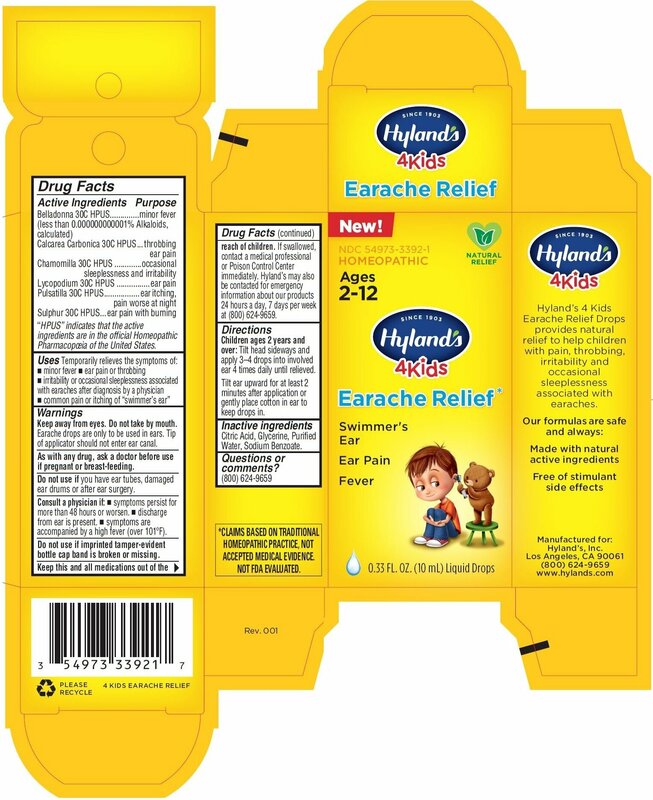 4 Kids Earache Relief with NDC 54973-3392 is a a human over the counter drug product labeled by Hyland�s. The generic name of 4 Kids Earache Relief is atropa belladonna,oyster shell calcium carbonate, crude,lycopodium clavatum spore,anemone pulsatilla,sulfur and matricaria chamomilla. The product's dosage form is liquid and is administered via auricular (otic) form. Auricular (otic) - Administration to or by way of the ear. Belladonna 30C HPUS (less than 0.000000000001% Alkaloids,calculated)Calcarea Carbonica 30C HPUSChamomilla 30C HPUSLycopodium 30C HPUSPulsatilla 30C HPUSSulphur 30C HPUS“HPUS” indicates that the active ingredients are in the official Homeopathic Pharmacopoeia of the United States. Earache drops are only to be used in ears. Tip of applicator should not enter ear canal. Do not use if you have ear tubes, damaged ear drums or after ear surgery. Do not use if imprinted tamper-evident bottle cap band is broken or missing. Symptoms persist for more than 48 hours or worsen.discharge from ear is present.symptoms are accompanied by a high fever (over 101ºF). If swallowed, contact a medical professional or Poison Control Center immediately. Hyland’s may also be contacted for emergency information about our products 24 hours a day, 7 days per week at (800) 624-9659.
over: Tilt head sideways and apply 3–4 drops into involved ear 4 times daily until relieved.Tilt ear upward for at least 2 minutes after application or gently place cotton in ear to keep drops in. Citric Acid, Glycerine, Purified Water, Sodium Benzoate. *CLAIMS BASED ON TRADITIONALHOMEOPATHIC PRACTICE, NOTACCEPTED MEDICAL EVIDENCE.NOT FDA EVALUATED.